At The Ruler Company, rulers are our passion and we find nothing more satisfying than knowing we have supplied the best quality rulers made from the best quality materials at the most affordable prices. We don't believe that you, our customer, deserves to be ripped off just to line our pockets. That is why we guarantee never to sell a sub-par product. We know and appreciate that rulers are one of the most important components to anyone's stationery collection, whether you are a self-employed freelancer, school/college student or work in the world of graphics and design. therefore, if you are looking for a strong and reliable one-metre ruler, you've come to the right place at The Ruler Company. We only sell quality products, made from hardwood, unless otherwise stated. 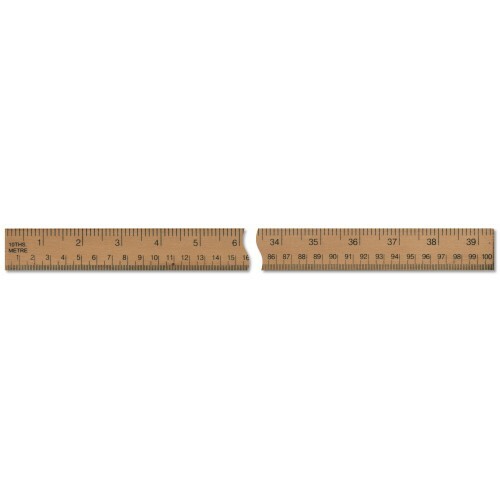 This one-metre wooden ruler is ideal for those larger-scale measuring and graphics jobs you might need to complete and is a great addition to your office stationery. Although it is not as portable or compact as many of our other rulers, it doesn't need to be. Perfect for classrooms, art studios and anywhere else you may need a straight line. With one edge featuring markings from 0 to 39-inches in 1/16ths and the other featuring 0 to 1m in cm, you have all you need to complete any measuring or drawing tasks. Rulers are a necessity for most people at some point in their lives, so why pay for inferior when you can get the best from The Ruler Company.